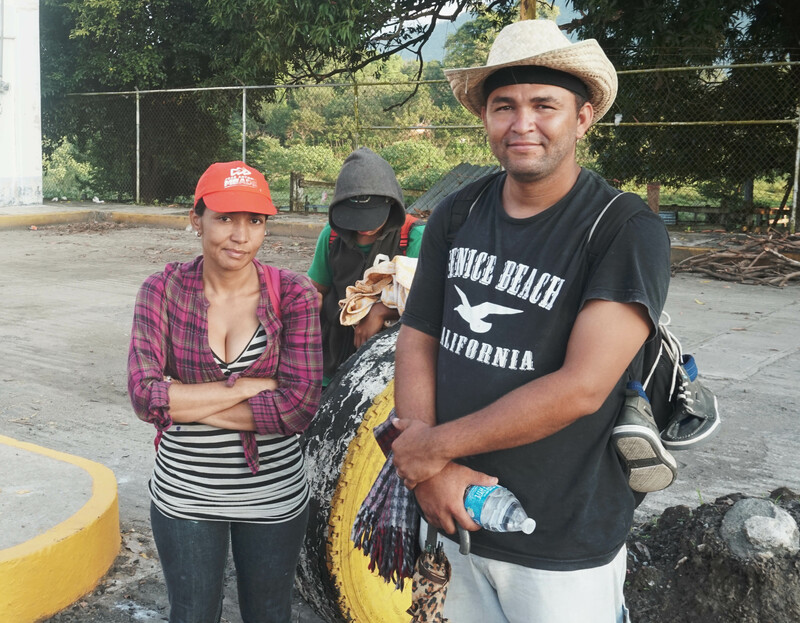 The following interviews were conducted in Chiapas, Mexico, a week and a half after the caravan set out from San Pedro Sula, Honduras on October 13. The other voice is that of a rural laborer who often works on coffee plantations for L50 ($2.50) per day. He is traveling with his wife and three-year-old daughter. He has a L20,000 ($1,000) debt from his previous three attempts to reach the US. I arrived when Katrina happened, when the disaster happened in New Orleans. It was very hard. There was work, but at that time I didn’t know much [about roofing]. Thanks to God, I made a budget to live on and I was able to build my house. The poverty we have is hard. Friend: Because of the president [Juan Orlando Hernandez]. Juan Carlos: Yeah, the president. The presidents of the US send aid and he takes it for himself. And the poor can only watch. [To friend] Mel Zelaya, you said? More or less he helped us financially. Electricity was much cheaper. But with this new one, there are people who even disconnect their electricity because they pay a lot, too much. We pay in the house almost L8000 [$330]. We don’t even have a fridge. We just have a TV and a sound system to listen to music. That’s it. It’s too much. I’m a trucker. By month, they pay L6000. $300 per month. Imagine, with $300 what you’re going to eat in a month. Where I’m from, if you pay the electricity bill, you don’t eat. We’re here struggling, walking from Honduras to the [US] border. It’s very hard. We hope, we ask our Father that the President of the United States opens the door to us, gives us an opportunity. Not to do harm, you know that Hondurans in the US only go to work. We don’t go to cause harm, but… Sometimes, there are [places] like New Orleans, that are rebuilt by Hondurans. Almost all Hondurans have done all that work. The work of modifying the buildings, paint them, fix them, carpentry, put in insulation, air conditioning. Almost all of us who have been there know how to do this work. So hopefully they’ll give us permission to work. I was at home and had been out of work for three months, and we heard the news [of the caravan] and we took the chance to go in a big group and maybe [the president’s] heart will be moved to give us an opportunity. Because the truth is that in our country the situation is very hard. A lot of crime, a lot of murders. Murders in kidnappings. Even in the road in this path we’re on, it’s dangerous because there are kidnappings and they sell the kids’ organs. So very hard. And you come by plane? I’ve paid [extortion]. They even killed my two brothers for extortion. So it’s hard. Because the truth is… everyone… me too. If I get a work permit, I’d take my family out of there. It’s hard, the situation there. A year and a half ago, they killed both at once. They were mechanics, they worked together in their own workshop. People saw that they were getting ahead, selling tires, all that. No one can get ahead in Honduras because they kill you. We were making the effort to get by there and now I’m the only one left. My mother’s only son. So I’m going to make the effort to see if I can help my mom. And five, six years ago they deported me from the US. I was in the building, in the apartments, and I went out to take out the trash to the dumpster, and there they got me. I wasn’t doing anything, there was no problem. I came and I was taking out the trash and ICE was there. And they took me and I was a prisoner for a month and a half in Baton Rouge. From there they sent me to Honduras. And now it’s hard to get back in. I’ve tried more than 20 times. I haven’t even gotten to the border. We’re not people who are going to do harm. We’re going to help the country prosper. Because, you know, in the US, we pay taxes. You work, you pay taxes. You live there and you help the country, because with the taxes, you’re paying, you don’t live for free. You go just to work. There a lot of are people from Honduras who have two jobs. Working in a restaurant during the day and at night working construction or painting or anything. It’s hard. We’re asking God our Father to act for us. I’ve spent a lot of money [trying to get to the states]. I had to sell my house to be able to travel. Because they even wanted to kill me. Because they wanted to kill my brothers and we looked alike. They wanted to kill me and I had to leave the Honduras. They’ve never let me return to the US to have a new life. It’s been hard. José, Wilmer and Erick are friends from a town in southern Honduras. They made it through elementary school, but their families couldn’t afford for them to continue to study. They talked about low wages, a failing health system and high electricity bills. Wilmer had opened a corner store, but the electricity bills put him out of business. José: Why the migration? Because in our country, there’s a lot of corruption, there’s hunger, families don’t get the food they need. The minimum wage is low, it’s going down. You don’t make a lot to support a family. We harvest pineapple, yucca, café. 100L. You make $5 per day. Erick: From 6 to 2, eight hours. José: You can’t buy anything with that. That’s why people migrate. Wilmer: I had a business. I only worked to pay the electricity bill! José: He had a business. A store. He closed it because he got an electricity bill for L10,000 [$412]. Wilmer: It was L8,350 [$344]. For a month. L8,350 it came to for me and there were months where it was L3,600, L4,000, at time L6,000. It varied. So I said to myself better to close it. It was a store, in Honduras we call corner stores pulperías. That’s why we came here, looking for a better life. Erick: And healthcare, how’s that? José: The people who migrate, we’re not bad people, criminals, we’re not from the streets or gangs. We’re in need, we’re people who are going to fight for a better future for the family. Erick: Only we know the situation in our country. Interviewer: Did you manage to finish high school? José: Elementary school. Just elementary school. José: I had to work. And if you work… I couldn’t study. I helped my mom, we’re four siblings, so I had to work. To bring something home. And to support myself. So there we are, working slowly. 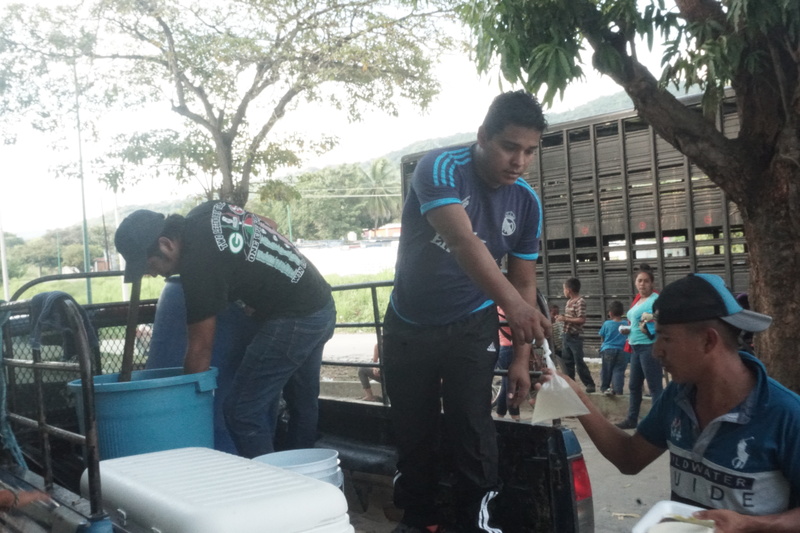 Gendi García, middle, from Pijijiapan, Mexico, distributes food and drinks donated by his community. Interviewer: Why are you supporting the caravan? Gendi: Because we see that these are people in need, and personally for me, for the kids, who come suffering, since they’ve been walking for eight days or more. As a human being and a Mexican… we support them. And here other countries have helped us too. So I think now it’s our turn to do this good deed for them. And hopefully it will be like this in all the cities they still have to go through, hopefully people give them a hand.